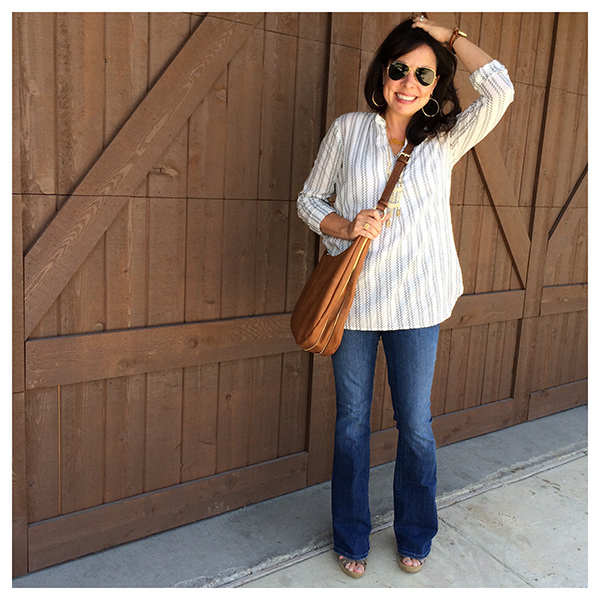 Today’s post is sponsored by JCPenney and ShopStyle. The product selections are my own, and I only highlight and promote pieces that I truly love. Thank you for supporting the brands that support Sheaffer Told Me To! 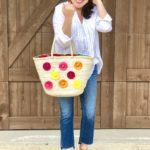 My JCPenney post from last month was a total hit! From your messages, I know that many of you grabbed the peasant tunics and absolutely love them. I also got lots of really great comments specifically regarding the cognac wedges and the cropped jeans. Click HERE for the post if you missed it. 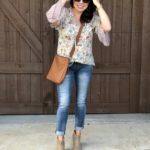 I highlighted 3 casual outfits and was so happy with the deals I found! Today I’m going to show you 2 more head to toe looks with JCPenney, but today’s outfits are going to be a bit dressier! AND GREAT NEWS! 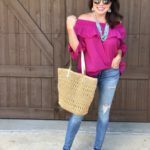 THE CODE 7TOSAVE will get you an EXTRA 20% OFF your UNDER $100 purchase and an EXTRA 25% OFF your $100 or more purchase! So, let’s start out with a dress! 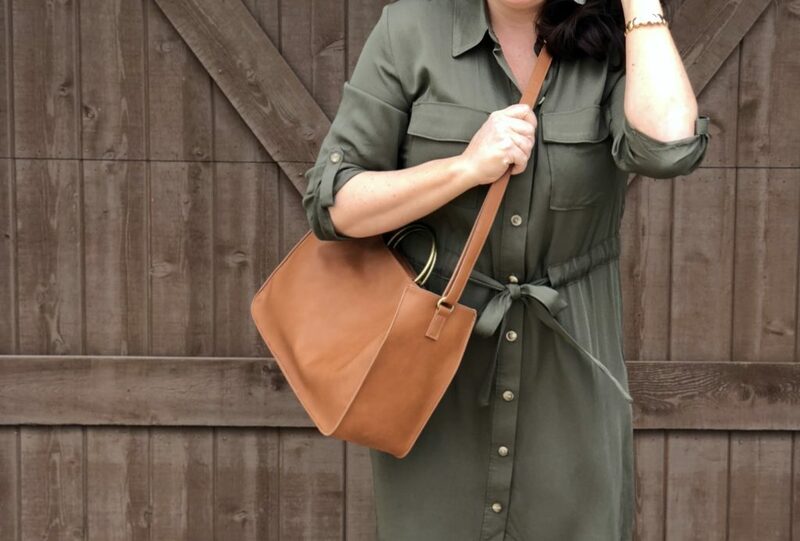 I love a classic shirt dress, and this one checks all the boxes. 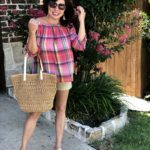 It’s comfortable, it’s soft, it’s flattering, it’s a perfect length (not too short, not too long), and it can easily be dressed up or down. The waist cinches in to give you some shape and make it just right for you, which I love. It drapes beautifully, doesn’t seem to wrinkle easily, and y’all know I always love a roll tab sleeve. This dress is effortlessly cute. And depending on how much you spend, the dress could be as little as $19.99!!! For size reference, I’m wearing a small. This olive green spoke to me, but it comes in a classic chambray as well. 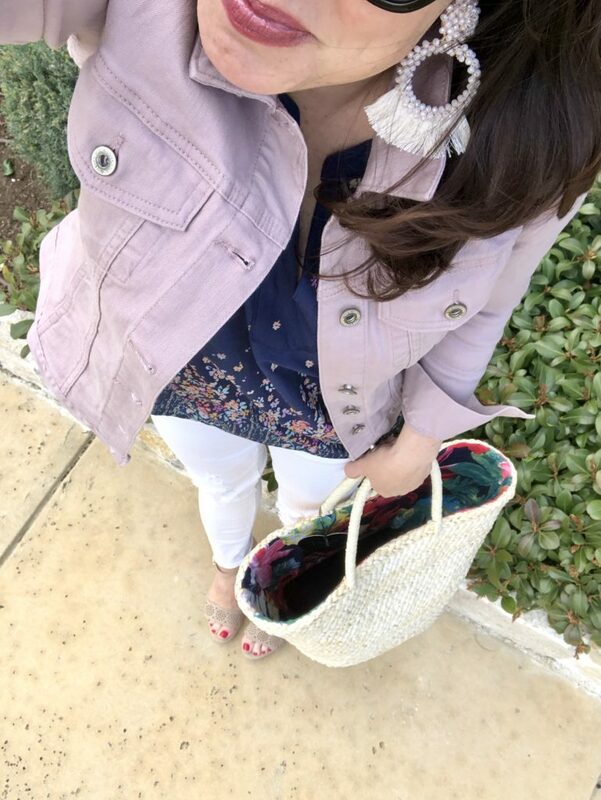 I think the chambray option would be so cute even worn super casually with Shoreline Converse. The details on the dress make it super cute on it’s own, so I didn’t want to overshadow the dress details with a lot of accessories. I went simple, and I’m glad I did. There’s another great cognac option HERE for under $15! Here are some other great affordable dress choices. Just click on what you are interested in! 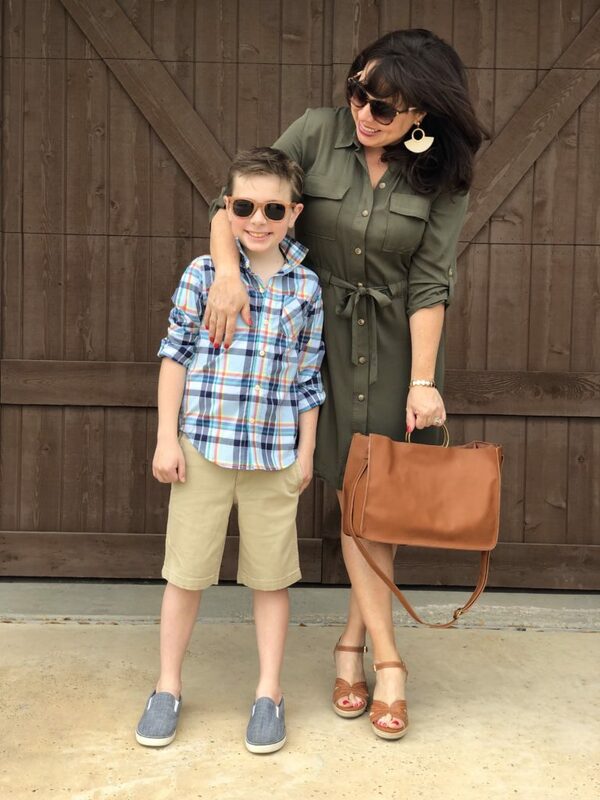 I wanted to get the little man to get it on the fun too, and these are perfect church outfits for both of us. Carter is 10 now, and he’s the best. He’s smart, funny, respectful, and most importantly kind. I cherish every moment of our time together and know that he will be all grown up in the blink of an eye. My heart can hardly stand it. And my goodness does he keep us in stitches. 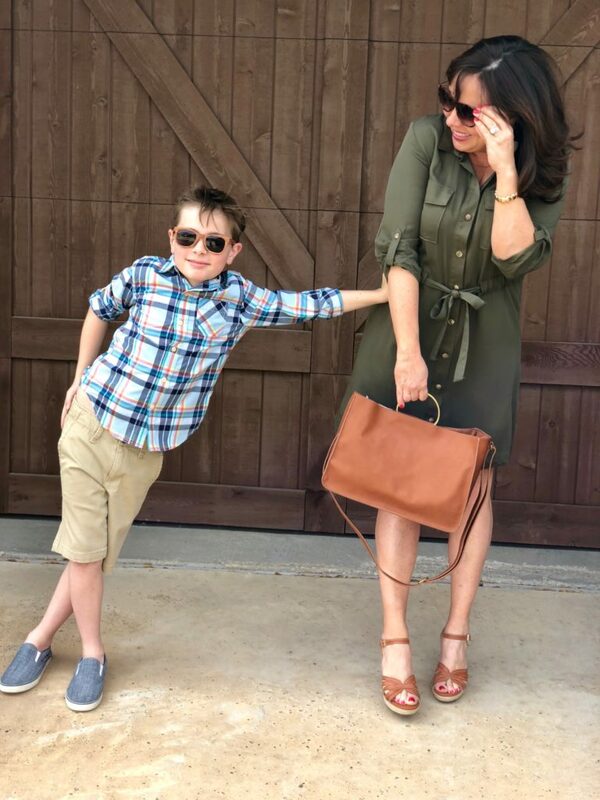 A little behind the scenes shenanigans….he unbuttoned this shirt all the way, popped the collar, and was calling himself Mr. Hollywood. He’s a trip. 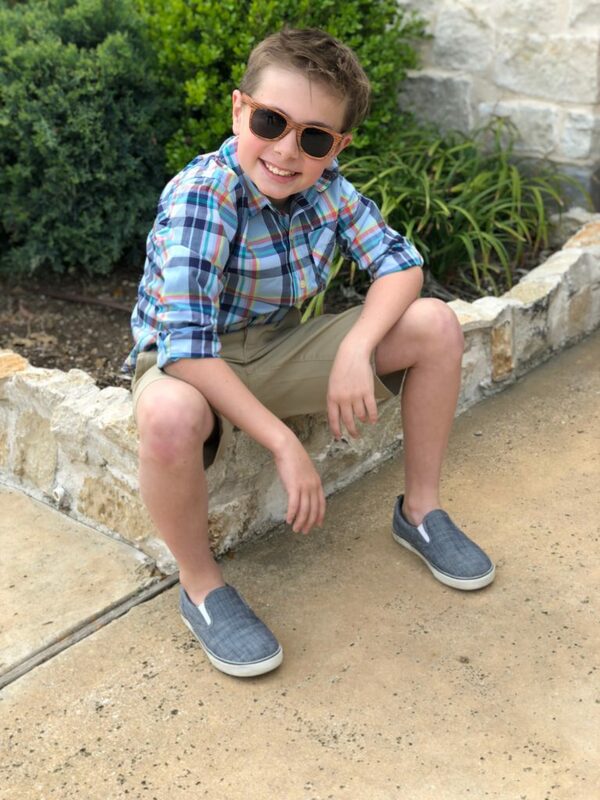 If you’ve got a son that needs a dress up option (maybe he needs something for Easter), you can find Carter’s shirt and shorts here. And I also included a great sandal option, as well as some other choices for shirts. 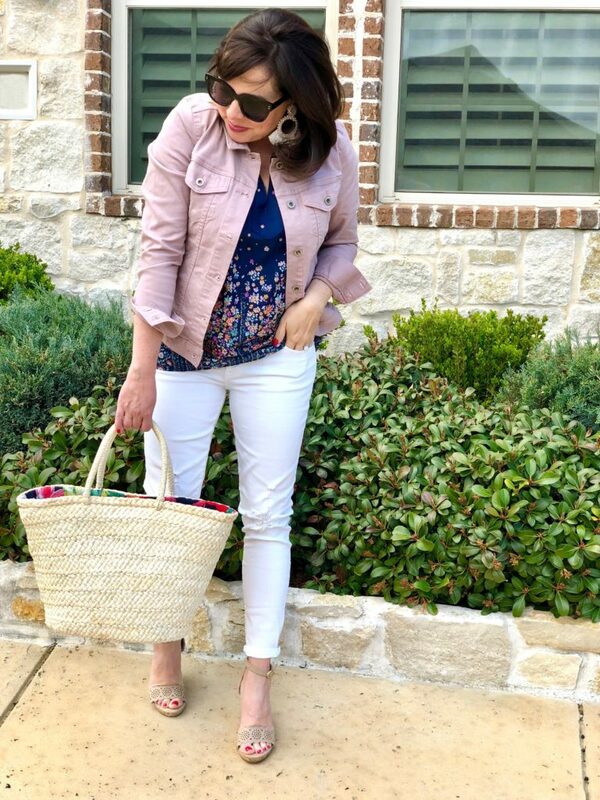 In addition to my “church outfit”, I also grabbed the white jeans that I highlighted in the last post in a casual outfit and threw together another outfit that’s a bit dressier. An outfit like this would be perfectly appropriate for brunch with family or even a casual church service. I of course love all of the pieces separately, but put together they make a really darling outfit. Depending on how much you spend, the denim jacket could be as little as $25.60! 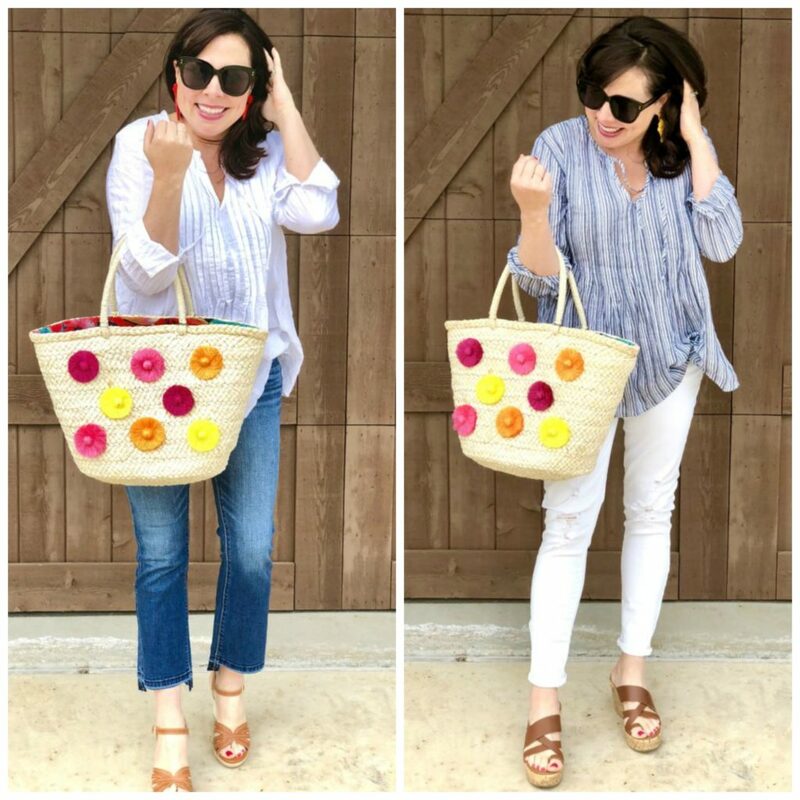 The blouse could be under $15, the white jeans could be under $23, the earrings could be just under $12, and you won’t believe the shoe special going on right now! 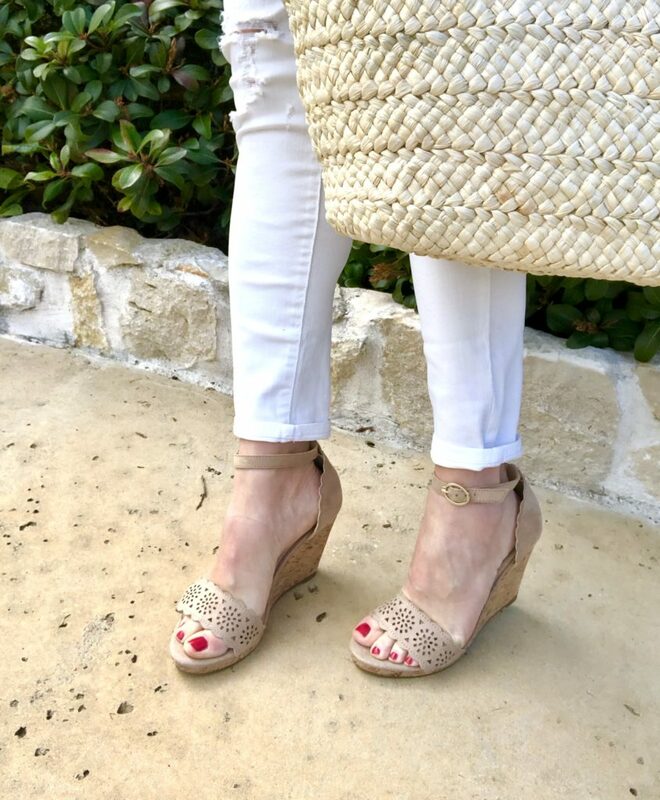 How great are these wedges in this wonderful light tan color?!? They are true to size, very comfortable, and would be a great neutral shoe to have in your closet. They also come in white and a very light lavender. And here’s an overhead shot. The earrings are large, so they make quite a statement, but they are very light! I also really love this circular turquoise pair. They look so expensive! 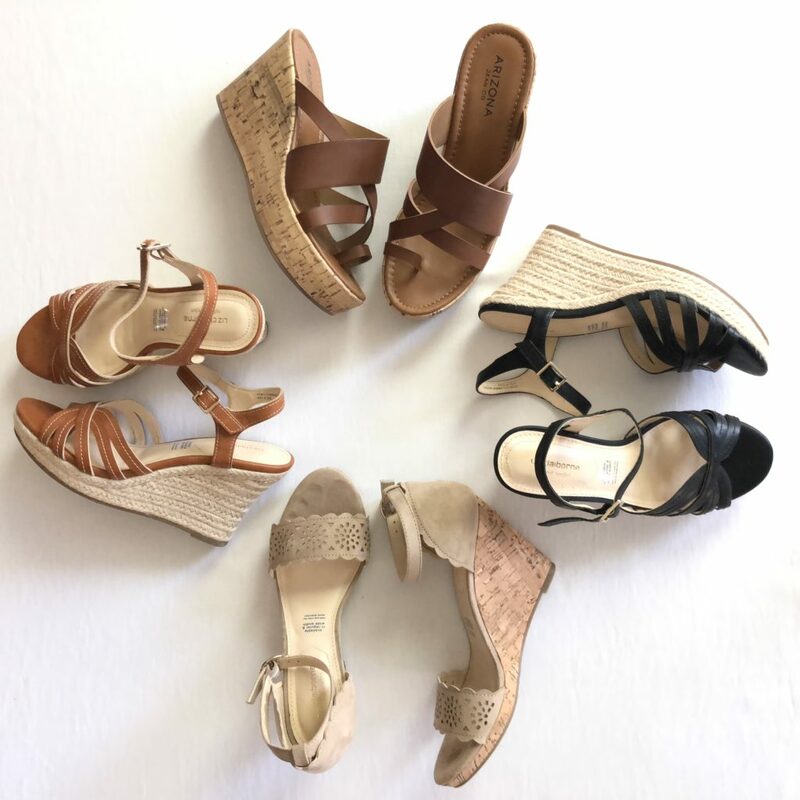 You’ve seen all 4 pairs of these shoes in the last 2 JCP posts, so I wanted you to see them all in one spot! They are all comfortable and true to size. AND Y’ALL! There’s a special shoe sale going on right now where you can BUY 1, GET 1 FOR A PENNY!!!! 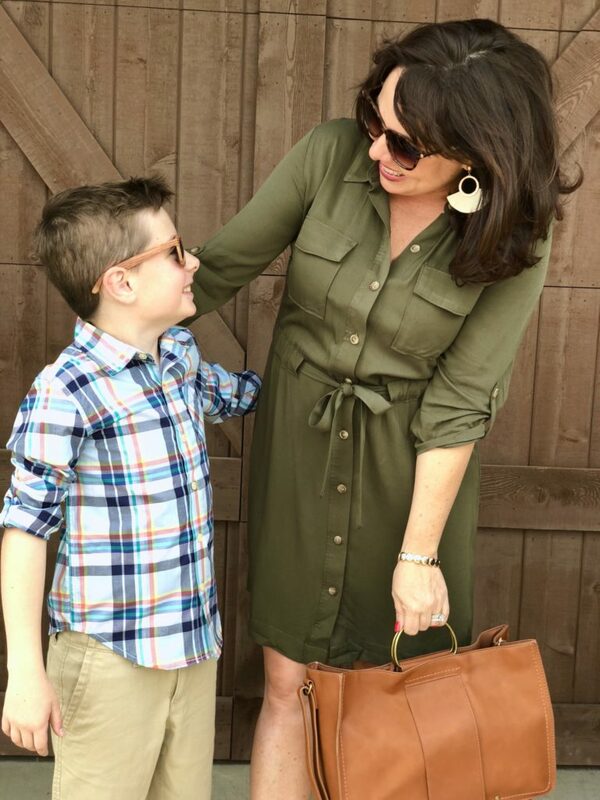 And if you want to take a walk down memory lane, click HERE for all of the details on these 2 outfits in last month’s post. All of the pieces (with the exception of the tote) are still available! 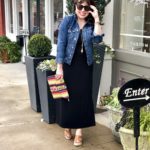 Thank you to JCPenney and ShopStyle for sponsoring this post. Carter is adorable!! 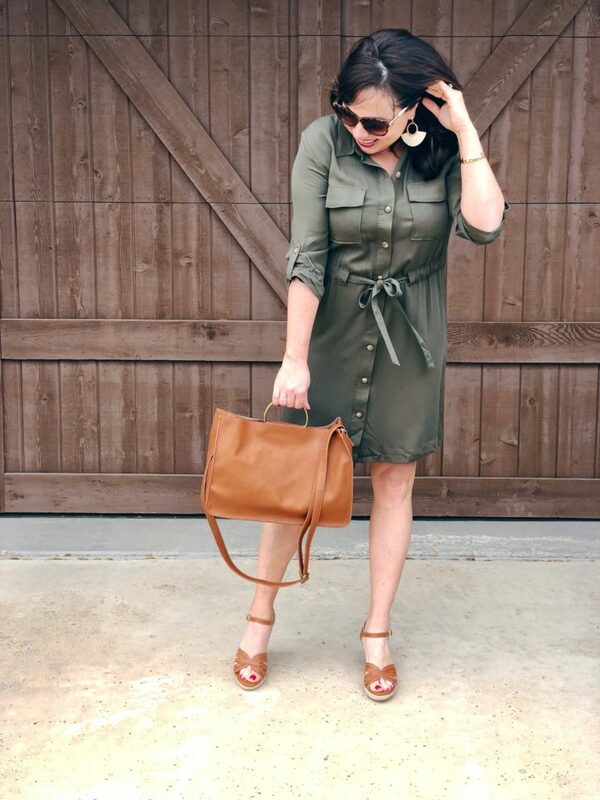 I love that olive shirt dress on you! What size did you get in the olive dress? TTS? I struggle with button ups pulling at the chest. Is that an issue with this dress? Thanks for the rec! It’s super cute! 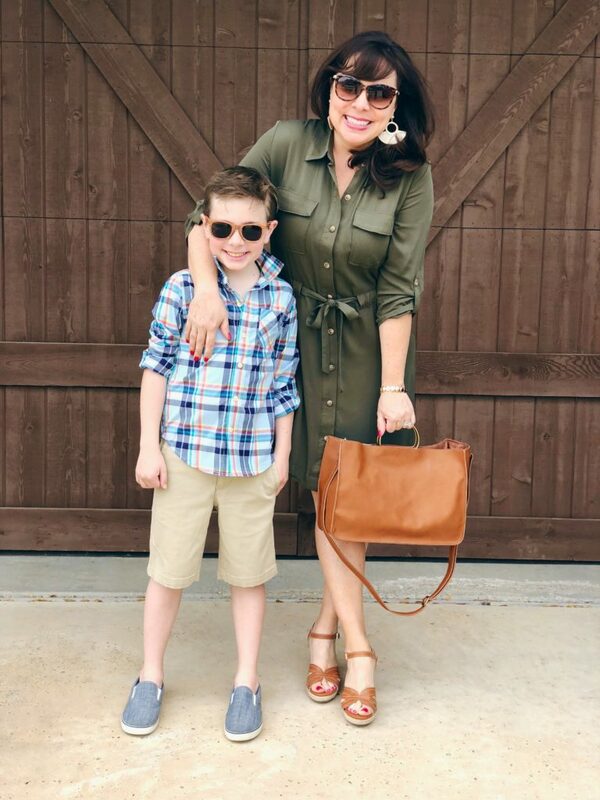 I love the olive dress! It is so cute on you! I’m so sad that it doesn’t come in a longer length. Could you post a link for Carter’s cute shoes? Thanks! Just a friendly suggestion-you should wear a half-slip with the green dress. Don’t want a repeat of Diana before she became the princess! Work it, girl. You look so pretty.